The excitement lives on as Fun88 brings you the best Live and IM Sportsbook products. Betting on sports has been a growing pastime in Asia these recent years due to increasing number of sports fanatics and sports enthusiasts. Most of them took plenty of time researching for the best odds and stroke of luck to make money out of betting. Here at Fun88, we dedicated our best 10 years (and counting) to providing our players the best tips and odds to help you win top prizes from our carefully-selected bookies. Whether it is European or Hong Kong, Over/Under, Handicap, and Odd/Even odds to bet, you can never go wrong waging on sportsbook with Fun88. Betting on sports starts with odds: the ratio between the amounts staked by the bookmakers as a bet, based on an expected probability. Odds are displayed in two ways. 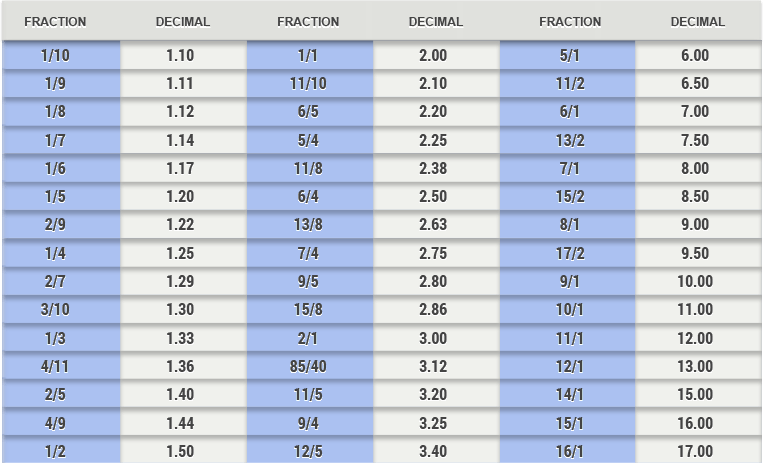 Odds that displayed as 17/4 is called fraction odds while odds that displayed as 3.00 is called decimal odds. Most sportsbook providers install options or controls where players can switch the view of the odds, accommodating the preference of their players. Decimal odds operates in a simple fashion. Basically, it multiplies your stake by the decimal shown and the answer is how much you'll receive in winnings - including your stake. So for example, your odds are 5.00 and you stake THB 1, you'll receive THB 5 in winnings (including your returned stake). Fraction odds operates on a ratio basis. Say your stake is THB 1 and you bet it on 2/1 odds, you'll receive THB 2 (not including your stake). Fractions odds are displayed as how much you could bet on versus how much you could win. The upper number in the fraction shows how much you will win if you place the amount shown in the lower number. Most sportsbook providers provide various options that cater to every bettor types. Basic bets like waging on which team is going to win in a match are extremely popular for starters in sportsbook betting. Any kind of sports goes well with this kind of bet, but soccer is the most preferred due to easier odds of winning. As for which sport to bet on, any sport can do as long as you know how it is played, the rules, and the best players or teams to bet on. For well-experienced bettors and punters, the use of AI accumulators is a normal case. They want to win big using bots that almost correctly predict the best odds. However, most sportsbook sites keep up with these schemes that they end up getting caught and instead not winning anything. Novelty betting is another betting type to be avoided. For those bettors who only bets for "the hype" or victims of the "bandwagon effect", they don't have the expertise to analyze odds. This result of them losing more money than they were supposed too and not gaining it back. As for the best sports betting website, my advice is to carefully take time to look around and decide which one of them do you truly trust and comfortable playing with. The pros evaluate each website by different wagers and odds as it is much easier for them to see which ones offer the best chances of winning. There is no definite strategy in winning big at sports betting, most of them depend on who's playing and what event they put their stakes at. Nothing beats on spotting value on every bet you are staking. Bad value bets are the way to lose money fast, while good value bets are never a bad idea even if they turn out to be losers in the end. If you are serious about sports betting as a money-making activity, it takes practice and experience in comparing odds and prices on various online betting sites. Stay focused on the sports that you know the most and you have higher chances to win big on sports betting. Sports and betting apps are recommended to keep you in the loop wherever you go. It is also recommended to specialize on one type of bet or one type of sport for much quicker wins and develop a much-needed edge on the bookies. Doing your research improves your chances of winning. While facts and statistics coupled with sports betting tips do not guarantee winners, if they are on the side of your bet rather than against it, then your chances are surely improved. Sports betting should be fun but if you start losing, take time to assess your bets, your wins, and losses. You need to analyze what works and what didn't worked out. Tracking your wagers can make you a better sports bettor. The last tip that I could give you is to have fun and practice responsible gaming!